Our 5 frame nucs are produced on std national DN4 frames. 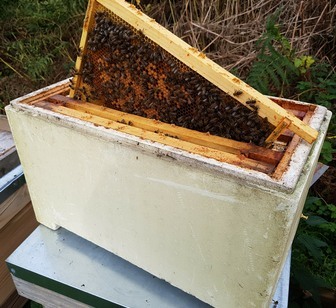 There will be 5 frames supplied in a reusable correx box and will have food, eggs, larvae, capped brood, bees and be headed by a 2019 mated buckfast marked queen (green). The nucs will be ready at the end of May beginning of June depending on the weather. We require a non refundable deposit of £60 then the balance of £135 to be paid on collection.